this afternoon I watched some of the 1939 Buck Rogers series. I saw lots of similarities with the sci fi movies from the 1980s - current day. I love the older methods of making sci fi movies - using the models & filming miniature sets. when I saw Moon I had the feeling that they'd done some of this but I haven't googled to check if this is correct or not. Buck Rogers has the tilted title text like Star Wars does, and the transporter beam like Star Trek, as well as the communications panel and tv screens zooming in on different locations - everywhere under surveillance like today's world. also I loved how the end of each episode had a slide saying the next episode would be seen at your local theatre - I think it'd be cool to have series shown this way again instead of the instantaneous methods we have today where you can download on demand or goto the video/dvd store or watch on TV in your lounge room. also I thought it was interesting that the leaders in 2440 were wearing capes and outfits that would fit in in feudal England or Rome. and the silver bathing caps and headphones that the modern people wore as protection and communication devices. and I loved the kaleidoscope effects behind the closing titles on some of the episodes. I saw so many things that seemingly influenced modern sci fi films. and the large spot lights reminded me of war movies where people escape from concentration camps or jail break films. I filmed my tv, so there's lots of flickering - buy or hire the series & take a look for a clearer view. Sydney's had a heatwave over the past few days. today reached 41 degrees in my area. I didn't feel it at home but once I went outside it felt like someone had opened the stove door and put Sydney in front of it. I went in search of air conditioning for lunch - along with the rest of the people in Western suburbs. it was like Christmas shopping parking conditions - long queues, available parking spots were quite rare. even when I left there were long delays. but it was better than walking - I would have melted had I tried this. I was in Mumbai last year when the terrorist attacks were happening. luckily I was not staying at one of the affected hotels. but I'd received at txt around 3am asking if I was ok, so I woke and started watching the tv. at that time the news media were reporting pretty irresponsibly IMHO - showing live footage of locations of the police and telling everyone what the police were doing. the journalists seemed to be in shock which was understandable, but it wasn't until mid the next morning that they started delaying the footage and not handing out details until later. at the time I was trying to use the internet too but twitter was overloaded all the time. I think I got a couple of messages through to facebook and my blog. I was recording some of the tv footage - the English speaking channels at least. the night before I'd recorded the ad for the Champions League cricket competition, which I think was canceled - or at least, the Australian team didn't go? there were many criticisms of the media's coverage of the event on the Indian blogs, and on Sarai list and Kafila blog & elsewhere. this week will be one year after the attacks. the Times of India website has some articles so tonight I was reliving the night and following day (where I'd flown to Delhi and later caught a flight back to Sydney). I'd been able to get onto a couple of people via mobile the next morning which made me feel better. and I'd had lots of calls from people from work too checking how I was which was comforting. I spent a lot of time in the following months reading the press articles and blogs. I read the confession of the arrested terrorist - he was the only remaining survivor from his group. I almost felt sorry for the situation he had found himself in and I kept wondering, at which point in all of this training did he not stop and think, "hang on, they're talking about killing people", and what sort of life he must have had in order to not find this a problem. it's awful what they did to the people of Mumbai and tourists. but it's also a desparate situation on his/their part too as I'm sure they were not the organizers behind the attack - just the participants, however willing. what a crazy world this is. it made me sad for a while to think about me being there (even if not directly involved) and what happened to the people involved and the whole situation & background of many of the people there that puts them into these situations. I think watching the tv made it worse as they sensationalized everything - really gave it the CNN / USA flashy headline - scare the public treatment. mini cupcakes are quite popular in Sydney these days - there's cupcake stores popping up everywhere selling fancy mini cupcakes. I haven't actually tried them before so when I saw the "Cupcakes on Pitt" store after I stopped for lunch I thought I'd try one. I bought a "cookies and cream" cupcake and a macaroon. I can't remember having a macaroon before either though I'm sure I must have at some time. these have become popular too since the first series of Master Chef aired in Australia earlier this year and the contestants had to cook macaroons as one of the challenges. I've saved the macaroon for tomorrow night - it's a strawberry macaroon. the cupcake was yummy though! Ian's video was called time travel. this initially brought to mind the Orbital song with the Star Trek TNG "Time Squared" episode sample for the Mobius & time becoming a loop. the past few weeks have felt like this for me - I've gone back to 2000, 2001, and hopefully 2003 this week if all goes well. I represented the data-body using text words as this is the medium of the book. 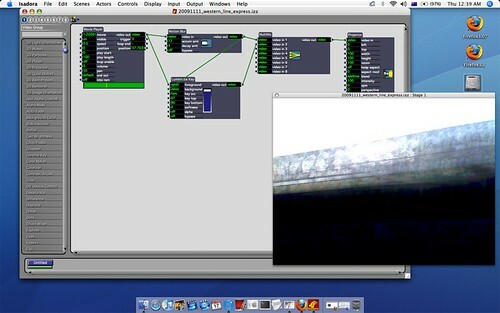 using Isadora I made a controller that would move the words around the screen - often blotting out the video of me playing in the background. but it's not really me - it's another virtual image -> mirror image of me, rather than the me I imagine in my mind, distorted by the join in the two glass mirrors and my face is covered most of the time by the camera - the recording of the data-body. the video is playing on loop with my washing machine as the soundtrack. a few david sylvian songs were the soundtrack for day11's #vlomo09 video. they make the train ride home from work a bit more interesting... these are video paintings - I made the isadora patch file - see attached. it's based on one I made for vlomo08 day 1's video : train ride home. most of my videos seem to end up with a similar theme - drive/ride to work, travel, hotels, some isadora files, some music/arts gigs or festival videos. such is my life I suppose. david sylvian's "secrets of the beehive" album is one of my favourites - it's perfect for when I'm feeling down (as is depeche mode) as I always feel better afterwards. I think it's the male vocal. and piano in sylvian's case. one from the archives for today. this is Garry Bradbury's session at TINA2003 where he gaffer taped Lucas Abela to the chair and then played his cut-up creation. I didn't have a good camera in 2003, so the footage is a bit dark. but gives you an idea.. Unpopular Music, A Benefit For FBi Radio. Pimmon & Jeff Burch (Solo Sets & Debut Live Collaboration as Mandala Trap), Comatone, Kyu, Anon, Scissor Lock, Anna Chase, Nick Wishart with DJ Sets from Kevin Purdy (Tooth), Tim Ritchie (Sound Quality, ABC Radio National) and Tom Smith (Cleptoclectics). finished reading "The Case of Charles Dexter Ward" by HP Lovecraft for class yesterday. so I went for coffee & eggs to think more upon spheres and came across a few circles & turns in my saturday travels.